Shaving soap can make or break a great shave. To make sure that you’re getting the closest and best shave possible, we’ve compiled all of the best shaving soap reviews we could find. We’ve done the research so that we can keep your skin and facial hair looking and feeling great. Here are some of the things that make a good shaving soap! Afterward, check out our top ten shaving soaps on the market right now. 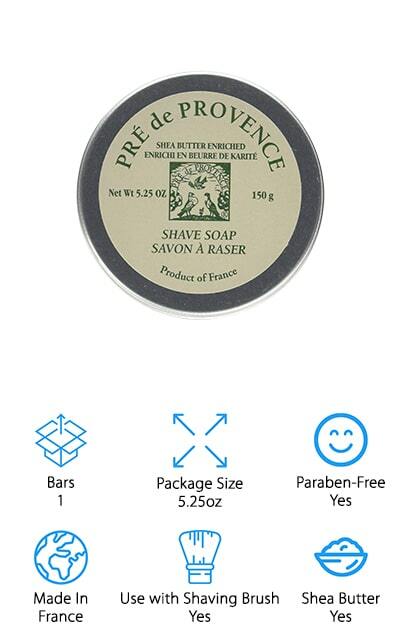 # of Bars: This will tell you how many pucks, cakes, or bars of shaving soap that you’re getting with your purchase. You can determine the value and see when you’ll have to repurchase your shaving soap. It’s great information. Package Size: How big is the package? Sometimes, one large bar can give you more shaves than several smaller ones. We’ll let you know how big each of the bars or pucks is in ounces so you have a better idea. Paraben-Free: Parabens are chemical preservatives that make their way into many products in order to keep them fresher for longer. They are also somewhat harmful. We’ll let you know if the shaving soap has these chemicals in the formula. Made in: Where is it made? For some people, this is an important piece of information. Soaps from other countries might be more highly valued, or you might want to keep your business in your home country. Either way, you’ll know. Use with Shaving Brush: Some shaving soaps can be lathered in your hands just as well, and some absolutely require a shaving brush. We’ll let you know if that’s the case with any of these soaps so you have a heads-up. Shea Butter: Shea butter is a great moisturizing ingredient that can help your facial hair and the skin beneath it stay hydrated. We’ll let you know if the formulas contain any shea butter so you can choose your best option. We want to bring you a selection of only the best, so we’ve done all of our research to present you with our shaving soap reviews. Our top pick and budget picks are our personal favorites and the highlights, so take a look at these before you make your final decision. No matter how you’re using it or how often, you deserve the best shaving soap that you can get your hands on. So let’s get started! The Blades Grim comes in first on our list with their amazingly luxurious shaving soap. It comes in a couple of different scents, but ‘smolder’ is the most popular – it’s a warm scent, masculine, with just a touch of citrus. 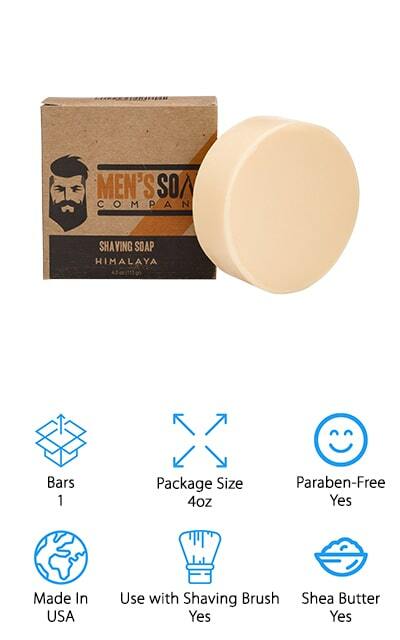 This soap will lather up in seconds, providing you with a close, perfect shave quickly. The puck comes in a screw-top container for easy storage, and it’s handmade entirely in the USA. Since 2014, The Blades Grim has been providing these amazing luxury shaving soaps. They’re simply the best, and give you superior protection and glide. That makes these some of the best shaving soaps for safety razors because it gives you a hearty layer of foam and soap between your skin and the blade. It’s a great place to start for a shaving beginner as well as a veteran looking to try something new. Use it with a brush for the best and most well-lathering results. 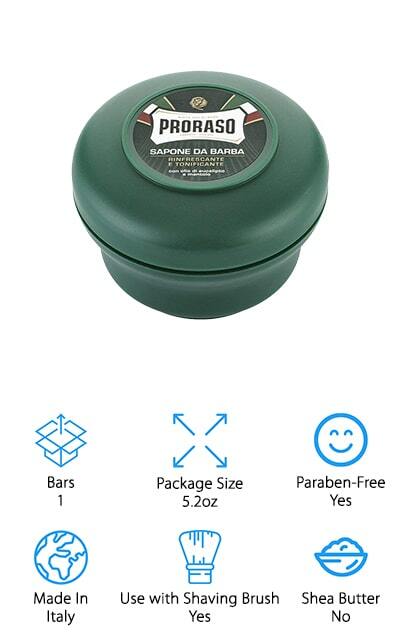 Proraso is a luxury Italian shaving soap that can get you up to a dense and creamy lather in just a few swipes. That gives you a close shave with little risk of nicks or irritation. It contains eucalyptus to help cool and refresh your face, as well as 91% natural ingredients. The soap is free of all parabens, phthalates, and silicones, as well as artificial colors. You’re getting the real deal with this almost herbal-smelling shaving soap. Use with a shave brush to get the most lathered and luxurious results. This soap is made with a special process that results in small batches that mature in about ten days, which allows all the moisture to evaporate and leave you with the puck that you see here. It’s a great-smelling, mostly-natural product that will make your skin feel great and moisturize as you shave. It doesn’t get much better than that, and you’d be hard-pressed to find a creamier soap! Henry Cavendish makes one of the best shaving soaps for sensitive skin in this shaving soap, which contains no artificial colors, fragrances, or chemicals – all of the ingredients are natural, and there aren’t that many of them to start with. That’s a very good thing in a natural soap. 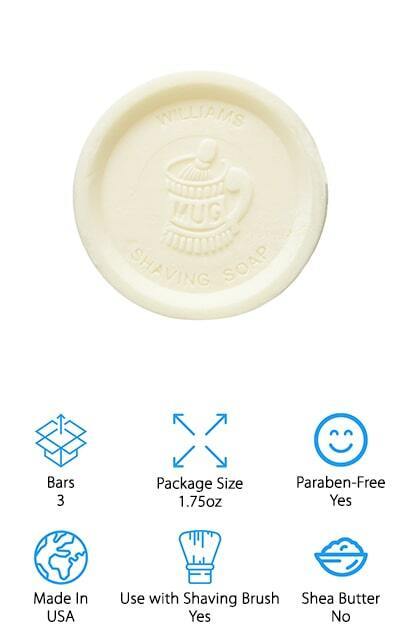 This is bigger than most mug shaving soaps, which means that it will last you about 3-6 months of regular shaving before you need a new one. It’s scented very lightly and naturally, which doesn’t smell like cologne or artificial chemicals. If it won’t fit in your favorite shaving mug, put it into the microwave for about 20 seconds and it will. You get more shaves for the small amount of work. Plus, it contains shea butter that leaves your skin feeling great and helps lubricate the razor for a non-irritating shave. To get the most later, use it with a shaving brush and apply liberally. You’re going to love it! Colonel Conk makes this great shaving soap for beginners. You get four different pucks, all in different scents to try out. They are smaller amounts, only 2.25 ounces each, but you can choose to purchase larger sizes of the ones you like. The four scents that you get are Bay Rum, Almond, Lime, and Amber – fairly simple, but they are each different. 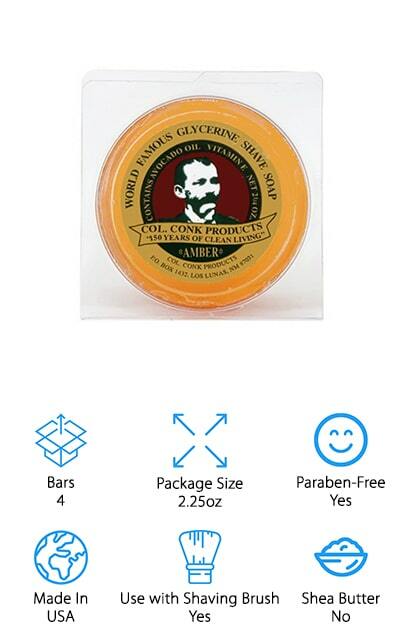 This is glycerin shave soap, so you’re going to get a thick, rich lather that will go on wonderfully and help to protect your skin against irritation and nicks and cuts. These soaps will leave your face feeling refreshed and clean. It’s one of the best shaving soaps, sensitive skin included. You’re going to love this soap, and we are fond of the variety of different scents that you get with your purchase. Then, you can choose whichever you like best to continue using. It’s made right here in the USA, and it’s a pretty amazing deal! Men’s Soap Company makes this 4-ounce soap puck that’s made of all-natural ingredients. They try to make the best soap possible without including a laundry list of ingredients that you can’t pronounce. 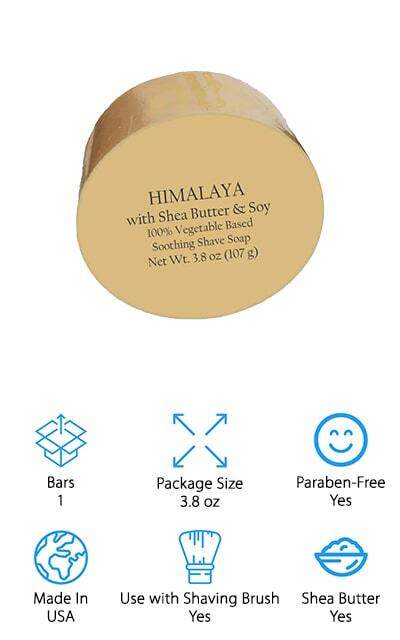 The Himalaya scent is mild, and won’t overpower you during or after you shave. It’s earthy and fresh without being flowery at all. This soap doesn’t contain any toxins, parabens, or dyes, so you know you’re getting a great natural soap that will leave your face feeling smooth and soft. In about 15 seconds with a great shaving brush, you can get a thick lather that’s going to make your beard soft and perfect for shaving or trimming. It doesn’t dry your skin out, due to the shea butter and glycerin base that the soap is made of. Say goodbye to irritation or razor burn with this amazing soap! Plus, it’s risk-free: if you aren’t happy with it, you’ll get a full refund! What is the best shaving soap for sensitive skin? The choice is ultimately up to you, but we’d like to put in a good word for Bell and Bull’s shaving soap. This blend of sandalwood and amber makes a great lather that works up quickly and helps moisturize your skin rather than drying it out. It uses mango butter to make sure that your face and your hair stay hydrated even after long shaving sessions. The soothing lather creates a rich barrier between your skin and your razor, to help avoid cuts and nicks while preventing irritation. It’s handmade right here in America, and the 4 ounces of soap you get with this purchase is concentrated and will last you a long time. 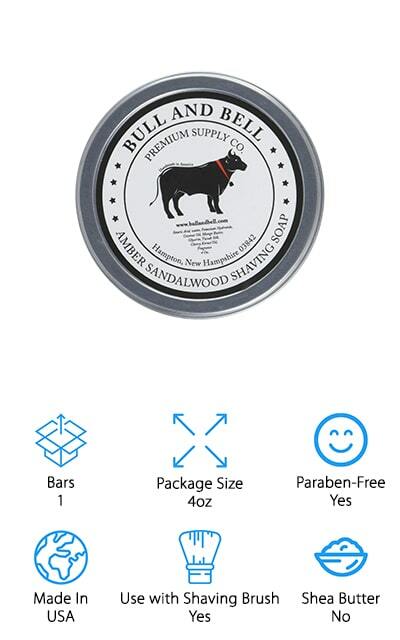 When you’re looking for a slick, smooth shave that won’t irritate your sensitive skin, look no further than Bull and Bell. You’re going to love the touches of flower and musk buried in the scent. This shaving soap by Williams is meant to fit right into your favorite shaving mug, so get it ready! You get three pucks of this amazing soap, based in lanolin so your skin will feel refreshed after your shave. It’s one of the best shaving soaps for hard water because it lathers differently than most other glycerin soaps. It’s tallow-based, so it works a little differently than you might expect. These pucks are only 1.75 ounces each, but you get three of them for the price, so you might say it’s a better deal. You can use a shaving brush with these soaps to get them to lather up really nicely for a smooth, thick application. Your skin will be protected from irritation and nicks and cuts, so it’s definitely worth a try. Your shaving mug will love having this soap to work with, and it will go well on your favorite brush and safety razor. Pre de Provence soap is made abroad in France, so it’s, of course, a little different than the soaps from here. It lathers beautifully when used with a boar bristle shaving brush; it creates a creamy, luxurious barrier between your skin and the razor. The company recommends that you allow the soap to dry between uses, that way you get more out of it. And you’re going to get plenty anyway because this super-large cake is about 5.25 ounces. It’s one of the largest on our list, so you’ll get plenty of shaving out of it. It comes packed with shea butter to help keep your skin moisturized and will leave you feeling smooth and touchably soft. It’s a gentle soap that will treat your skin right, and leave out all of the irritation that you might feel from harsher soaps. If you feel like treating yourself or need a gift for the man in your life, this is it! Van Der Hagen is the company behind this luxury shave soap that comes in a pack of three. 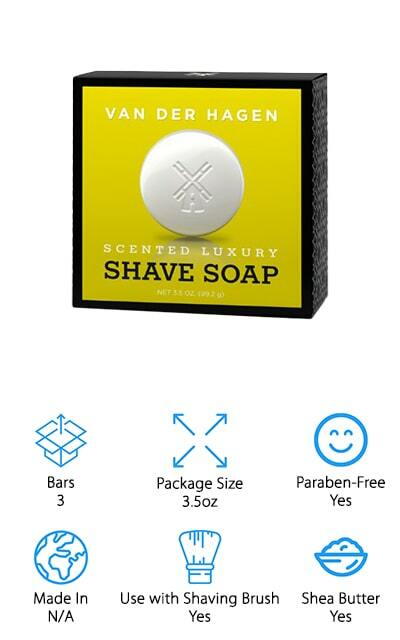 Each of those three bars is 3.5 ounces, so this is a great value when it comes to shaving soaps. They are hypoallergenic and made with more than 10% glycerin to help soften and moisturize your skin. It also softens up the coarser hairs on your face. In fact, the way that it works and the amount that you get makes this one of the best shaving soaps for head use, if you’re looking to get a clean, polished shave. It’s made with vegetable-based ingredients and is made cruelty-free so you can use it with a clean conscious. When you want greatly-improved razor glide and smooth, soft skin left behind, go with this Van Der Hagen luxury soap. It’s made with hydrating Shea Butter and performs best with a shaving brush. We know that you’re going to love it! After you try out this Era Organics soap, you might believe it’s the best shaving soap in the world! There are absolutely no chemicals in this shaving soap. It’s based in olive oil rather than some of the other products that soaps are usually made of, which means that it will improve the way your razor glides across your skin while also softening up hair follicles and exfoliating as you shave. This will help to reduce irritation generally caused by shaving. It’s a Vegan-friendly format that’s Cruelty-Free and doesn’t contain any parabens, sulfates, or even SLS. Still, this soap will hydrate your skin with each shave and make it easier than ever for your razor to work. You’ll get a closer shave and your skin will definitely thank you for the pampering. You get one puck that is 3.5 ounces, but you’re going to want your beard to grow faster so you can use it again!